The day after climbing the Col du Tormalet (82 miles and 3,700m of climbing) my legs were less exhausted than I expected. If I had done 3,700m of climbing in the UK (on much steeper climbs), my legs would have been more tired. Flying back in the afternoon, I just had enough time for a two hour ride. 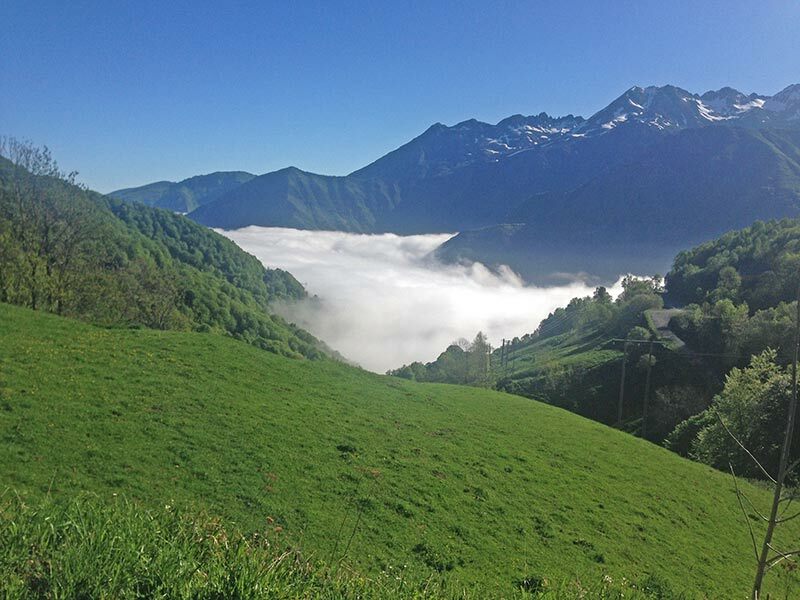 I took the long gradual descent from Garvanie to Luz Saint Sauveur – and then up to the mountain top of Luz Ardiden. 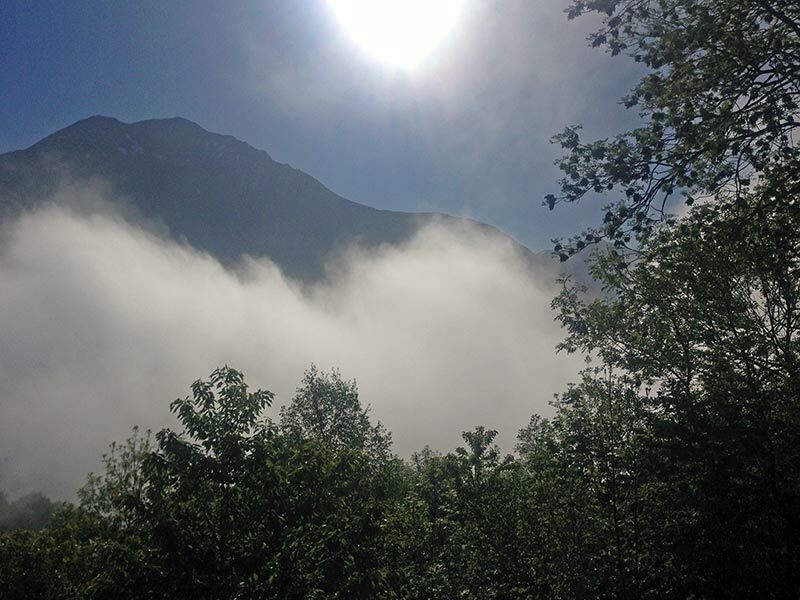 The weather was near perfect; with the morning sun burning away some low lying cloud. It made for some stunning views; I just regretted only having an iPhone 5 camera. Still the iPhone took some good very photos. It was a very quiet morning. On the 45 minute climb uphill, I didn’t encounter a single car or bicycle. The only person I saw was an old farmer getting his sheep ready to travel up the road. Apart from this farming incident, the road was completely deserted. If cycling uphill as quick as you can with tired legs is your idea of fun – this is as close to cycling heaven as it gets. Though one man’s heaven can easily be another man’s hell…. And near the summit I can’t remember what I thought! Trees on the lower slopes of Luz Ardiden. The lower slopes of Luz Ardiden are the most gradual – just 5% for a few kms. This lulls you into a false sense of security – easily picking up a good speed and perhaps putting in a little too much effort – effort that needs saving for later when the climb becomes harder and unrelenting. But, after this gradual start, the climb soon picks up to 8% and stays at that remorseless Pyranean gradient of 8-9% all the way to the top. Cycling uphill, I was only vaguely aware of the surroundings. I was concentrating on cycling, rather than being a tourist. 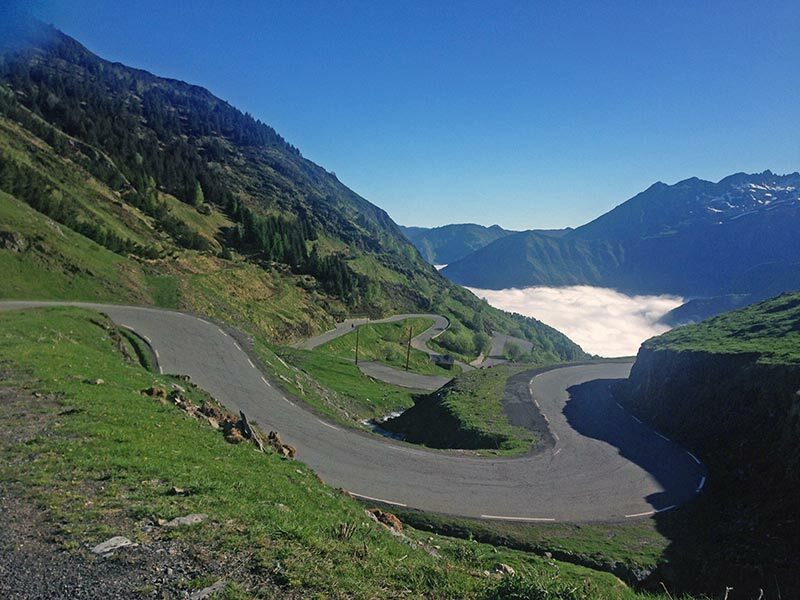 I did enjoy the 180 degree hairpins, they give just a brief respite from the gradient – especially if you take them wide – they are also like a psychological target – they are more frequent than on the Tormalet. Like the Col du Tormalet, there are signs every 1km telling you of what is coming up and how far there is to go. 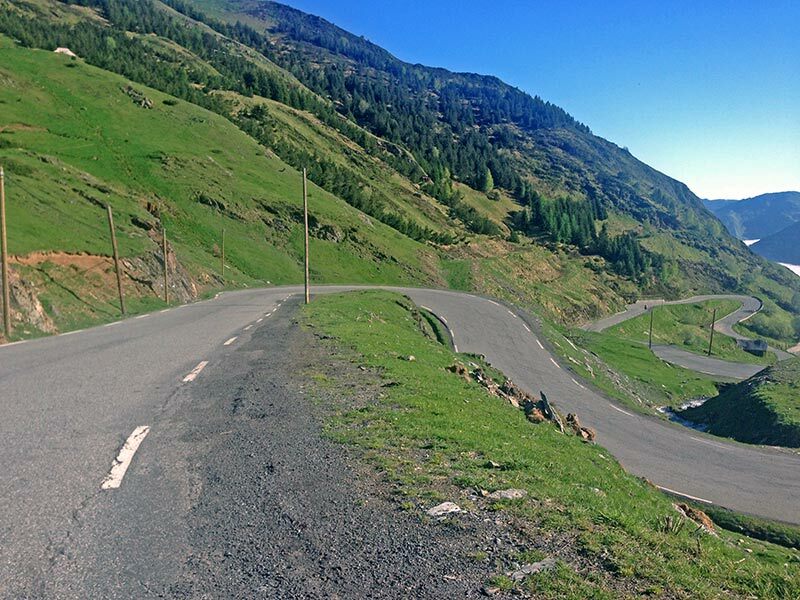 It is hard to measure effort levels on Pyrenean climbs, when you are not used to riding on them. For a long time, the speedometer seemed to hover around 10-11mph (16-17mph) It was a big effort to try and keep it above 10mph all the time. Like the previous day, there was this constant uncertainty about how hard to go – but you learn to let go and just get into a good rhythm. I did the climb in 43.29 an average speed of 11.2 mph (18 km/h). It would have been great to know what time I could do with a couple of days rest. But, I only had three days in the Pyranees, and this is what the Tour de France is all about – racing day in day out. It was really hard doing another mountain climb, but also a really good experience. 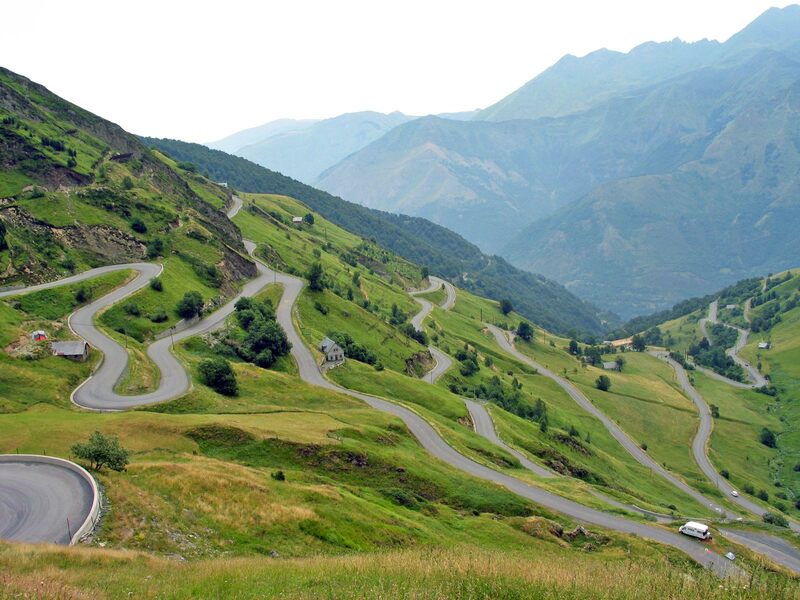 When you get into the rhythm of these Pyranean climbs, you’d like to be doing them everyday. It’s perhaps a good job I had a flight in the afternoon – otherwise I would have probably ended going up the Tormalet again. Today, I did a 25 mile flat recovery ride around Oxford to Ambrosden – it’s just not the same as the Pyrenees. The descent of Luz Ardiden was great. More satisfying than descending the Tormalet somehow – it’s kind of fun to break into a hairpin corner then accelerate away. 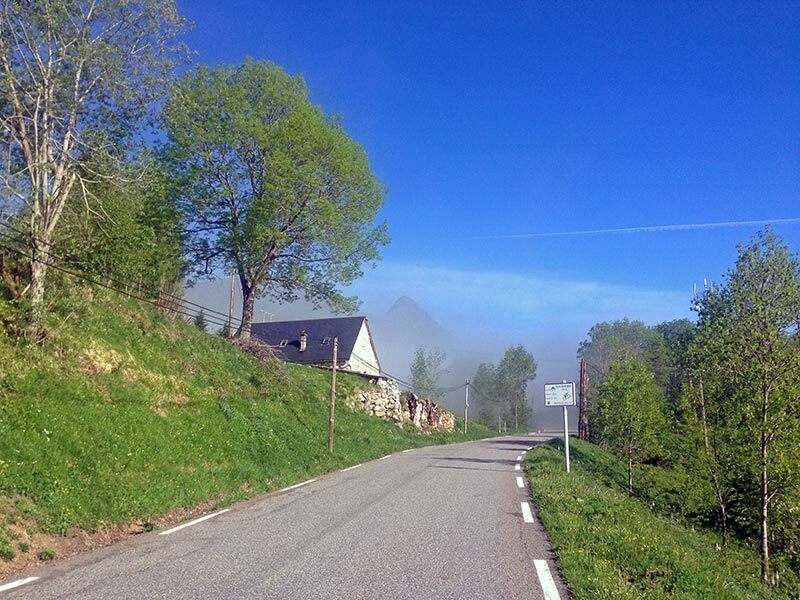 It would have been enough to ride the Col du Tormalet just once – let alone three times. But, Luz Ardiden was the real icing on the cake. It was a pleasant surprise to realise climbing mountain passes day after day is not as impossible as you might think. It’s definitely hard work, but it’s not like racing up steep British climbs and going deep into that anaerobic level of suffering. In three days of cycling, I managed around 7,500m of vertical ascent; it was hopefully good training, if nothing else. A well engineered climb is a thing of beauty. Hairpins near the top. Luz Ardiden was first used as a Mountain summit finish in 1985, where the stage was won by Pedro Delgado. It has been used eight times in total. The most recent time was 2011, when Samuel Sanchez won. Miguel Indurain won in 1990 beating three times champion Greg Lemond – a rare occasion where he won a stage which was not a time-trial. There will not be many 80kg riders who will be able to climb this 8% climb as quick as Indurain did. The most famous incident at Luz Ardiden was in 2003, where Lance Armstrong was knocked off his bike by a spectator (bag got caught in handlebars). The fall seemed to galvanise Armstrong into action; he won the stage by 40 seconds and took the yellow jersey to France. A decade later, his title was revoked for doping. It’s a shame these iconic arenas of cycling are tainted by this doping history. But, the climbs are there for ever – let’s hope the doping become a footnote of history. 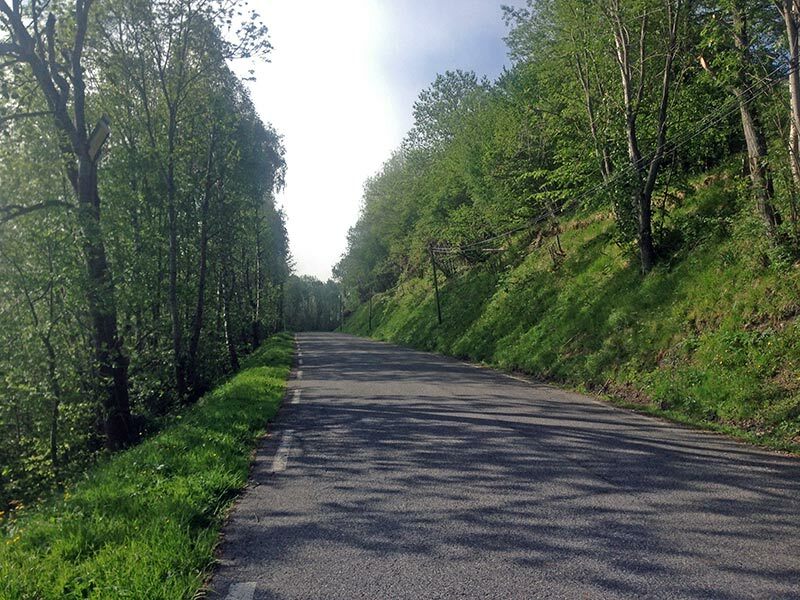 When you see the pristine beauty and raw elegance of these Pyrenean roads it really makes you want to appreciate the purity of the cycling endeavour. Great write up and photo’s Tejvan, you are getting me interested in going and I have never been abroad before. Looking at Strava and your times up these “classic’s” I think it shows more definitely, what a great climber you are. 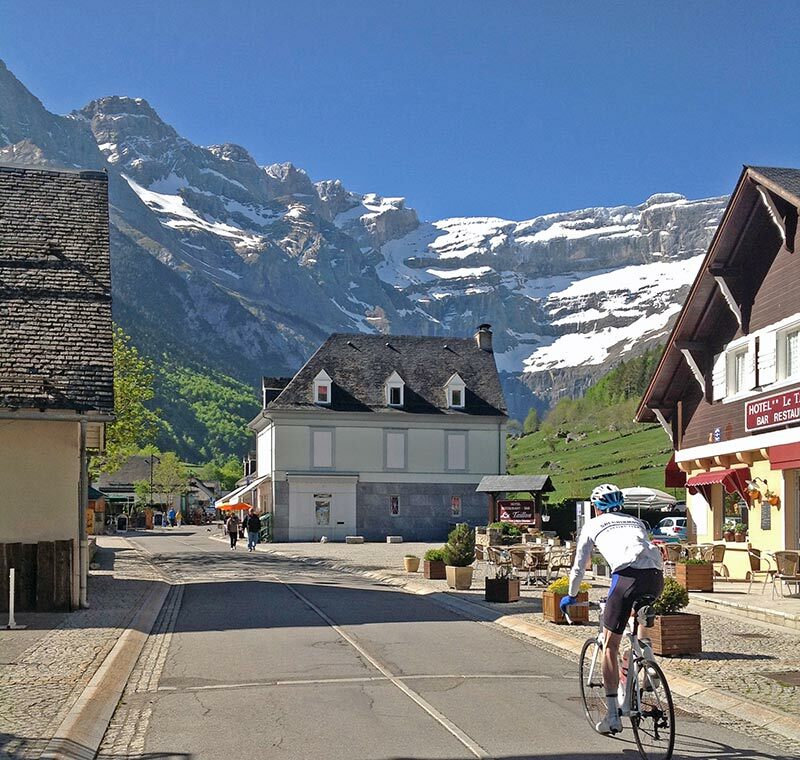 It’s been great reading about the alpine climbs as wells as seeing your great times posted on strava!